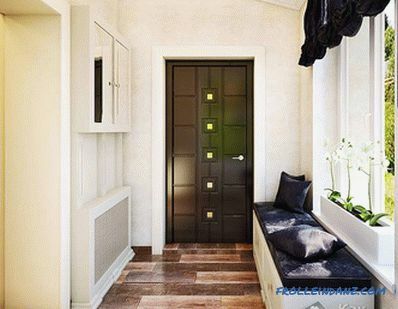 Usually, when carrying out repair work at home or in an apartment, it is customary to engage in the corridor last. And there are reasons for this, because a corridor is a passage through which workers walk, construction materials and garbage are carried. If you perform the repair at the beginning, then all efforts may come to naught. 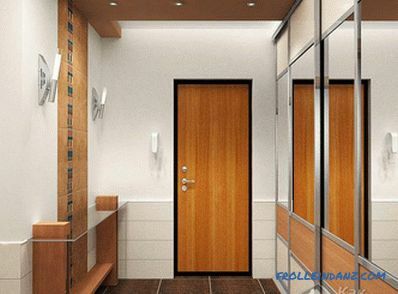 It is for this reason that you should do repairs in a small corridor, when all the other rooms are already repaired. Despite the small size of the room, you should not treat the repair irresponsibly and frivolously. 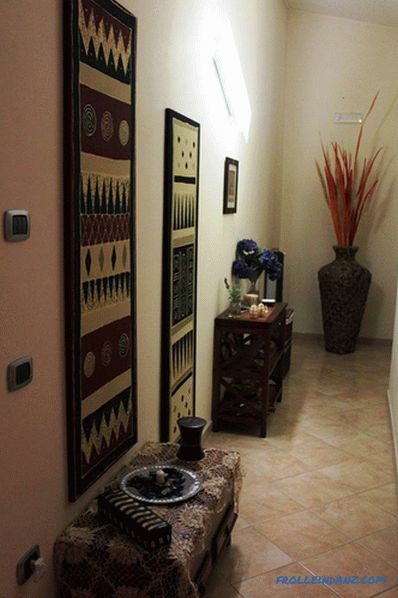 After all, the corridor is the first thing that guests see when they come to your house. No wonder some call it a business card host. 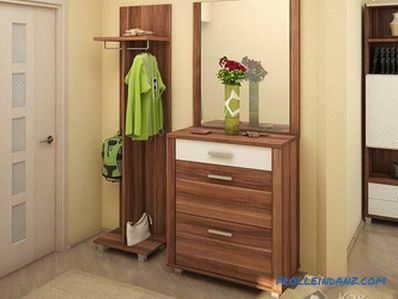 Therefore, you need to make every effort to make your corridor worthy. In this article we will consider the repair work in the corridor, which can be performed independently, without the help of specialists. So, you can save your money and try yourself as a worker. 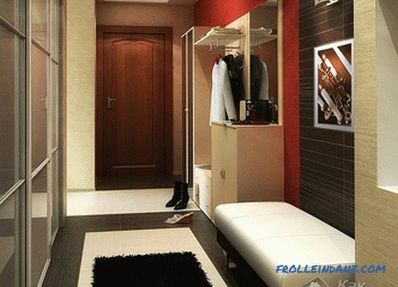 Corridor - a specific room with its own characteristics, which should be taken into account before proceeding to work. This is especially well understood by those people who live in Khrushchev, because their corridors are too small, narrow and lack natural light. If you live in a private house, then in the rainy weather the walls can get sprayed, or they can be soiled with melted snow. It is in the corridor that all the dirt that you bring from the street will settle. One should not lose sight of the fact that the corridor is subject to various temperature fluctuations, as a result of which rot and even mold can form. To avoid these consequences, it is important to consider them and clearly plan the scope of work and materials to be used. 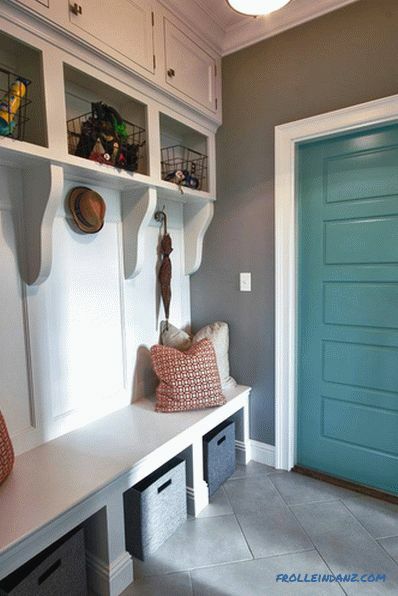 Organizing space to visually expand a small corridor. Wall surface finishing. How to carry it out and what can be chosen as a facing material. 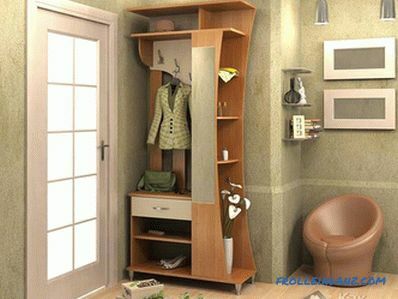 Selection and installation of furniture. The range of materials for finishing the corridor is amazing. You can do it any way. But the choice of material is significantly influenced by the layout, the total area of ​​the ceiling, walls and floor, and, of course, your taste. And now for all the details. If the corridor is small, then nothing can be done about it (if you wish, you can, of course, complete it, but only in a private house). It can only be done more visually. How to do it? Modern technologies allow you to decorate your walls and ceiling so that the room seemed large. The first way is to install a stretch glossy ceiling. It is able to visually increase the small dimensions of the corridor, thanks to its glossy surface that will reflect all the objects. 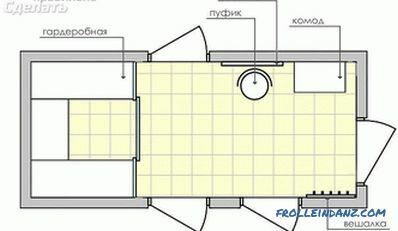 Since the area of ​​the room is small, difficulties in installing such a ceiling should not be. The second method is to install large mirrors on the walls. This way you can also create the effect of a larger corridor. 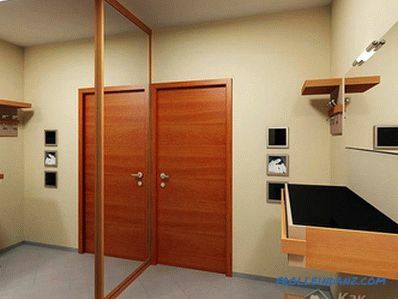 Sliding wardrobes, the doors of which are equipped with solid glass, are gaining immense popularity. 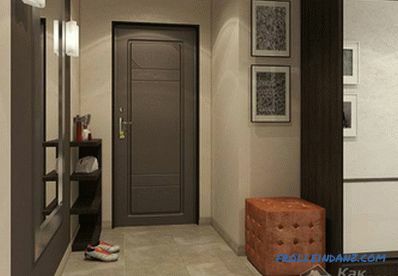 Due to their design, they are quite compact, since the doors do not open outwards, but are able to move apart. Moreover, you can kill two birds with one stone: not only increase the space, but also save space that would be occupied by the hanger. 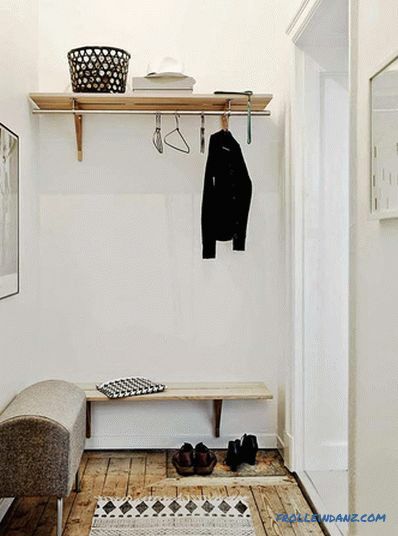 There you can put your shoes and hang clothes. 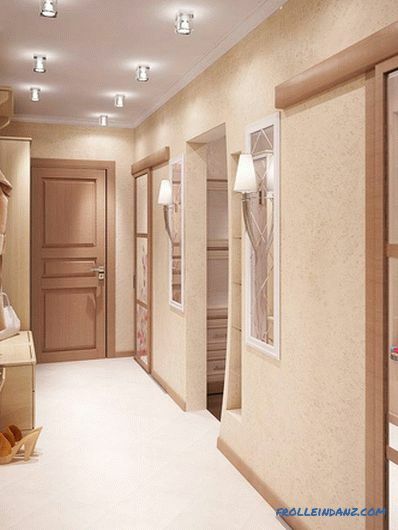 Designers are advised to use light colors in the design of the corridor. In their opinion, light colors can increase a room, and dark ones, on the contrary, reduce it. Therefore, choosing a finishing material, consider this fact. Another little trick is lighting. The better it is, the bigger the room seems. All you have to do is think through these points, purchase appropriate material and bring everything to life. if necessary, plastering of problem areas. Be sure to carry out the preparatory work to quality repair was at a sufficient level. Using the moment, make sure that the wiring is working properly, the insulation is not damaged anywhere and no replacement is required. After all, after the repair is completed, it will be problematic to resolve the problem, since it will be necessary to remove the new finishing material and all efforts will go down the drain. When you have plans to replace the door, do it in advance. But the foundation preparation does not end there. Walls after cleaning should be plastered, making them smooth. To avoid the formation of cracks, you can stick a reinforcing mesh for interior work on the wall. Usually it is embedded with a soft grater in the starting putty. In order for the decorative finish to look beautiful, the walls must be smooth. This is especially important when you plan to hang a mirror on the wall. To do this, apply on the walls leveling mixture layer by layer, checking all the level. Your walls are prepared, now you can do the finishing material. Let's take a look at how to ennoble the walls. Cork wallpaper Cork wallpaper. The name speaks for itself - the material is made from cork. Having examined them, you will see a paper on which a thin layer of cork is pasted. 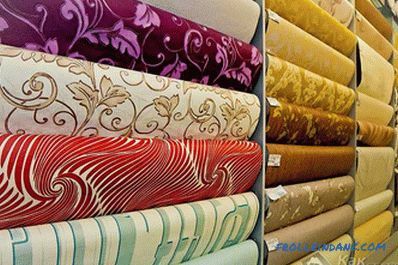 These wallpapers have many advantages: they are hypoallergenic, do not collect dust, just take care of them and easy to clean. But they have one drawback - they are dark. 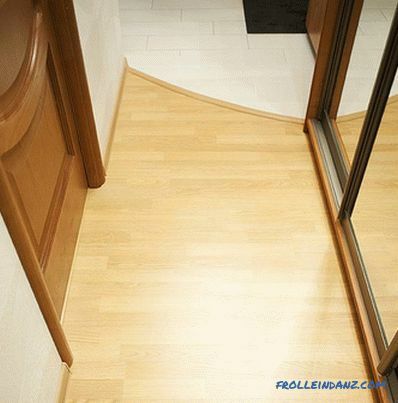 If your corridor is small, choose a different material. 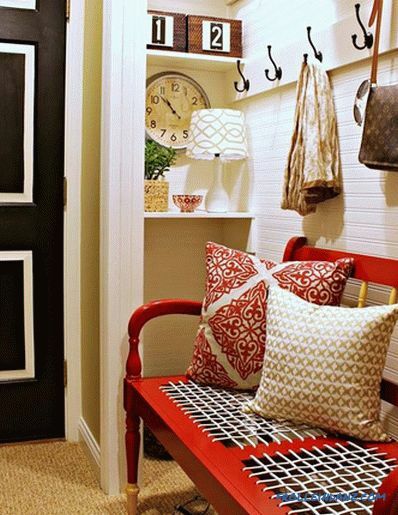 For the same homeowners, whose corridor is spacious enough and light, cork wallpaper fits perfectly. All you have to do is purchase wallpaper in rolls, glue and brushes, and stick them yourself. Vinyl Wallpaper. Many people remember vinyl records used in the past. But nowadays vinyl is still a good material. 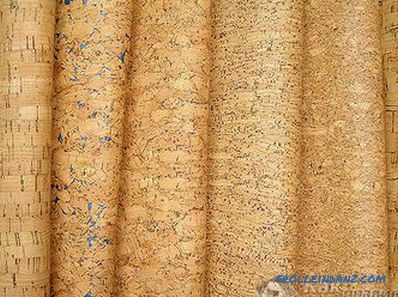 Vinyl wallpapers have a long life, they can be washed using a rag or a brush. This fact is very important, because the repair is done in the corridor, where the most dirt. A special feature of the material is that they can have a fabric and paper layer, which is covered with PVC. The surface of the wallpaper is decorated with various patterns, ornaments, patterns. You can choose color scale to the taste. Thanks to the PVC layer, the surface of the wallpaper is protected from dirt and moisture penetration. And to prevent mold and mildew, they added a special chemical composition. One type of vinyl is silk-screen printing, which will look great on the wall. The minus is the synthetic material, which is why such wallpapers do not let air through. Liquid wallpapers. Material that is “stuck in development” between plaster and ordinary wallpaper. You can buy as a ready-mix, as well as dry, which includes silk, paper and linen flakes. These wallpapers are very easy to apply: the composition is kneaded based on the proportions specified by the manufacturer, and is applied to the wall with a thin layer of about 2 mm. This method is good because all the irregularities left after processing the walls can be easily hidden. 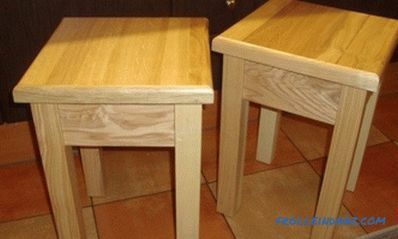 To wash them, the surface should be varnished. 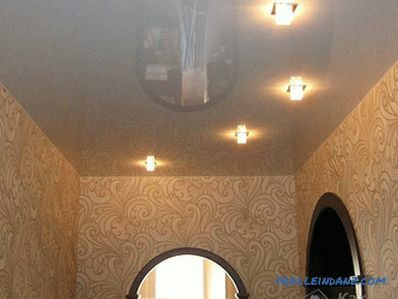 If you get tired of finishing, or you again start repairing, then remove such wallpaper is not difficult. 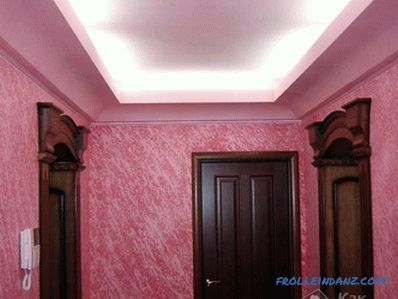 Decorative plaster. Such walls will look very noble, because such plaster can be applied in various ways. 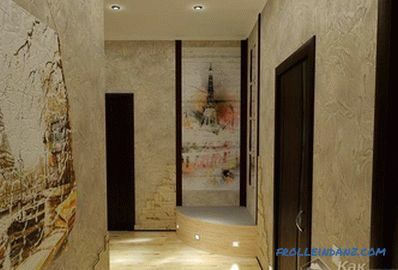 Thanks to this technology, the wall can be decorated with a lively landscape, various patterns and even paintings. If you are an uncreative type of people, even just rough walls will also look rather extraordinary. But it is important to note that the price of the material is rather big. Therefore, in advance, calculate all the costs and estimate whether you will have the money. Some mixtures contain stone chips of different colors and shades, which will allow to enter the corridor into the overall design of the home. The advantage of decorative plaster is a practical, aesthetic look and the ability to clean and wash the surface. Minus - put the mixture on the wall alone will not be easy. Other types of finishing materials. The above materials are by no means all that can be used for lining the corridor. For example, you can simply paint the walls in the desired color, pre-putty and polish the walls. Another option - pokleit wallpaper for painting, so that the wall has acquired some texture. In such cases, suitable washable paint. Separate sections of the walls can be laid decorative stone. 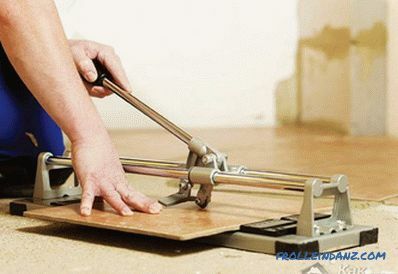 Wall paneling is a simple and quick way to sheathe a wall. Moreover, all these materials can be combined by combining several finishes.Show your imagination or just look at the photo at the end of the article. All in your hands. The weakest place in the corridor is the floor, because it is subject to considerable load. Also, the floor is the dirtiest place in the corridor. Moisture, dirty shoes, objects transported through the corridor - all this leaves trash. You need to make it versatile, easy to clean and withstand heavy loads. The best option for finishing the floor can be considered tile. This material is durable, durable, hard to scratch, but at the same time caring for them is quite simple. Before you carry out work on the final finish, you need to check the condition of the old flooring. Rate it visually, knock on it. If an empty sound is heard, it will have to be dismantled and made a new tie. But it is even good, because with independent heating, you can consider the option of floor heating. 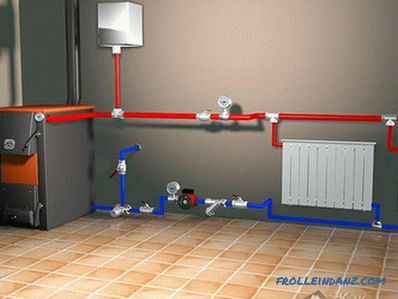 It can be done both in the traditional way from the heating system, and use an electric floor heating. The second option will be much more expensive. In order to properly perform the screed, you need to pour concrete on the beacons. Before installing them, the base should be prepared: eliminate all visible defects, cracks, gouges and chips, and putty. All the dirt, dust and debris are also cleaned. The surface of the floor should be abundantly covered with a primer. Only then can you set lighthouses and fill the floor. On such a basis you can lay any material. Which one? Let's find out. Linoleum. Material "economy class", which everyone can afford. But do not judge the coverage by price, although its cost is low, it performs its functions perfectly, coping with all sorts of pollution and moisture. It is very easy to remove dirt from it, and it is a pleasure to wash the surface, which is very important for the corridor. 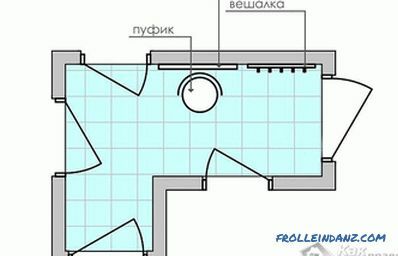 The presence of various patterns and drawings only enrich the interior of this small room. But there are also disadvantages, unlike laminate or tile, linoleum is short-lived, and it is easy to damage. Although you can purchase options and more expensive, having a rather dense and thick base. The wear resistance of such linoleum is much higher. Tile. Ceramic tiles can rightly be called one of the most practical and reliable materials that are used for flooring. 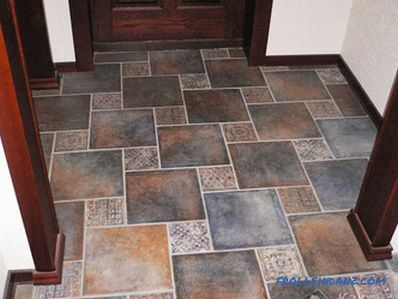 Its durability and resistance to chemical and mechanical stress makes tile an ideal option for flooring. Despite the fact that you will need to make an effort and tinker with its styling, you will make a good and durable base. You can also choose any color, texture and patterns. When choosing a tile color, keep in mind that a light color can increase a small corridor, however, it will have to be washed more often. But the dark tones will help to hide various pollution, which can not be avoided. Laminate. 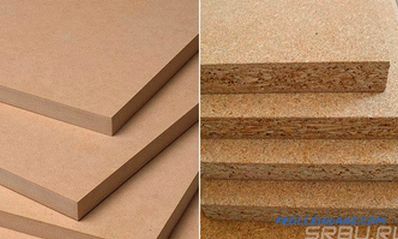 Like all materials, it has its advantages and disadvantages. It is very easy to mount, the main thing is to provide a smooth surface. Laminate above 33-34 class durable, wear-resistant and durable. Just take care of him, wash and clean. Only here, like all materials from wood, it absorbs moisture well. Although this is not a big problem, since there has long been a laminate, which included a moisture barrier that provides reliable protection from moisture. It should be noted that you will not achieve silence with such coverage, since, walking on it with heels or other shoes, you will hear all your steps, and not only you, but others in the next room. Another An important element of the corridor is the ceiling. How it will be designed, what work needs to be done, and how to do it depends on the height of the corridor. For example, if the height allows, on top you can equip niches for storing various things. And you can make such a ceiling of drywall. This is one of the simplest finishes, but quite spectacular. Height can be reduced by an average of 150 mm. When you have high ceilings and there is a stock, this is a good option for ceiling decoration. Its main advantage is that you can make a flat surface, so you do not have to level the base. And if your room is small, as mentioned earlier, it can be visually enhanced by combining a stretch ceiling with plasterboard. Some go even further and mount mirrors on the ceiling. This is quite original and completely solves the problem with a small corridor. When the funds do not allow you to realize such ideas, you can decorate the ceiling with ordinary wallpaper, for example, for painting.You can choose any light color that fits well into the overall picture of an apartment or house. 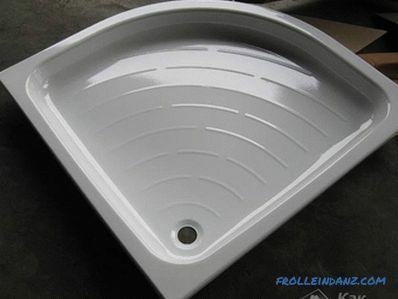 The simplest and most inexpensive option of finishing the ceiling can be called polystyrene foam plates. The surface of the ceiling must be leveled and glued to the special glue plate. No matter what material you chosen for the ceiling, it is important to provide good lighting, since the natural light in the corridor is almost absent. 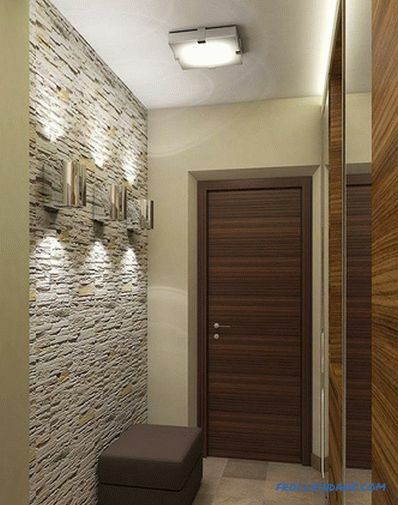 To add more light, install wall lamps, ceiling lights and other lighting fixtures in the hallway. You can use the lower light, thanks to which you visually expand the narrow room. When doing work with the ceiling, in advance, take care of the additional installation of lighting. It is much easier to make such an illumination on a false ceiling. You can also use floor lights or light paintings, and to make the corridor modern, use mobile lighting. Whatever you choose, remember, your main task is to provide good lighting in a dark corridor. This is especially important when there are mirrors on the walls, in which everyone often looks at themselves before leaving. After your the walls and ceiling are decorated, there is already a solid base on the floor, and there is a lot of light in the corridor, it’s time to start choosing and installing furniture. To logically complete the end of the repair, you need to responsibly approach this issue. 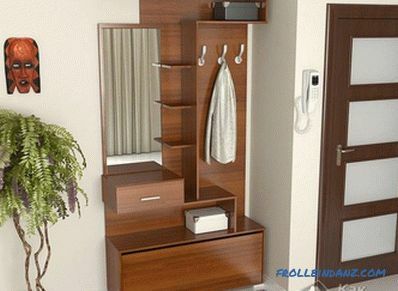 Very popular is the built-in furniture, thanks to which you can save and so little space. To install it, even at the stage of repair work, you need to prepare niches in the wall in which the furniture will be placed. 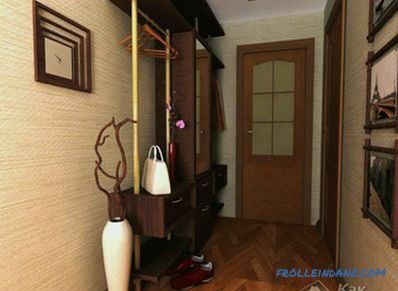 Another option is to purchase a ready-made hallway. In this case, you need to consider that when choosing furniture, you should start from the interior design that you have already made. An important factor in the purchase - compactness, reliability and convenience. how to glue vinyl wallpapers correctly.